Celebrities are just like us, eh? We see them eating burgers, taking out the trash, or walking the dog, and we're supposed to believe that they're real humans. Well, thanks to that pesky reality-checker known as science, we have physical proof that celebrities are actually not like us — beauty-wise, that is. On a complex scale developed by Dr. Kendra Schmid of the University of Nebraska Medical Center, Lena Dunham ranks a 6.82 out of 10. Kate Upton is hotter than Beyoncé, and Brad Pitt is a near-perfect 10. Sounds like all the unnecessary picking apart of the Girls creator and star is, well, unnecessary. Unsurprisingly, though, very few celebrities actually rank below 6. If all this boggles your mind and you're wondering how in the world these seemingly arbitrary indicators of beauty can be determined, you're not alone. We were scratching our heads, too. Presumably to the end of answering that question, Schmid released her method. Here's how she figured: It's essentially basic middle-school math and geometry, relying on the age-old principle that symmetry is the surest sign of true beauty — the perfect 10 has a perfectly symmetrical visage. 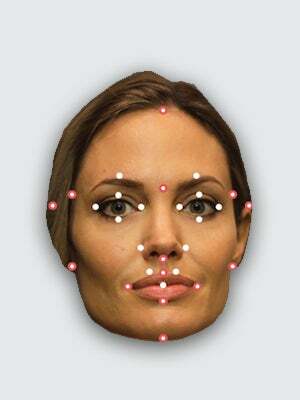 Using 29 points around the face (mouth width and eyebrow points, for example), Schmid draws lines to measure distances. To get a perfect score, the distance between the eyes should be equal to the width of one eye, the nose is the same length as an ear, and the overall face is in line with the Golden Ratio equating to 1.618. Feeling a little lost? No worries. Check out HuffPo's nifty infographic, instead of trying to follow our math. If there's one thing we learned from arithmetic it's that visuals are more valuable than words. Disclaimer: While science is cool and all, we are strong believers that beauty can't be determined by mere physical appearance. Each individual's idea of beauty is as unique as they are...though, to be honest, we can probably all agree on Brad Pitt.